The history of mankind and the history of the military and wars are deeply intertwined. In school, it seems that they always taught history in terms of one war or another. Nevertheless, we find a lot of spoons somehow connected to the military, or military history. In other pages we have looked at battleships, the Spanish-American War, old forts and military monuments. But this page concerns itself with more generic type of military spoons. Perhaps one of the most easily recognized generals in history. Napoleon altered the course of European history. "We have met the enemy and they are ours"
This rather non-descript long handled spoon from Korea is engraved with a personal message. 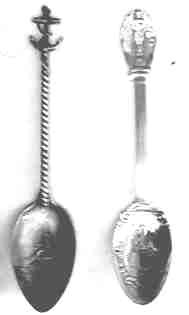 The custom of giving a silver spoon as a present has a long history dating back hundreds of years. It is interesting to note that it was still alive in 1968. 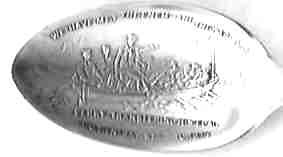 Even though the spoon is not exciting to spoon collectors, I am sure that it invoked many memories for the man who received it. 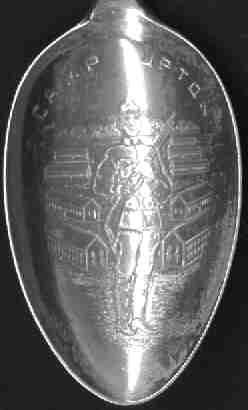 An interesting spoon with a ship finial top and a stem of crossed rifles. Just below the ship it reads "B.C. Volunteers". I am unsure of the meaning of all this. My preliminary research indicates that a group of British Columbian (Canada) volunteers sailed to S. Africa to fight in the Boer war. I suspect that this spoon is related (but I am open to other interpretations). 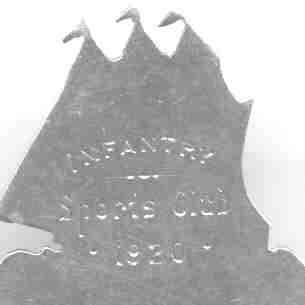 Spoon made in Birmingham in 1920.